Update: This was a PuneTech April Fools’ Day prank. See this post for the full story. There is plenty of anecdotal evidence that we are in the midst of a major recession, and it is having a significant effect on the Indian software industry. Now there are hard numbers giving an exact idea of how much the recession is expected to affect the software industry in different cities in India, and the results are interesting, to say the least. This video is a sensationalized/misquoted version of this news item. Please read this whole article before viewing the video. Click here if the video is not visible. 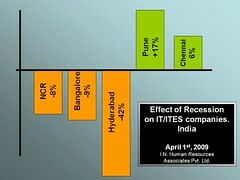 INHR Associates, a Noida-based human resources consulting company, conducted a survey of over 400 CEOs, CFOs, heads of business units and other executives with P&L responsibilities from 250 software companies across 10 cities in India to get their estimates of the impact of the recession on their business in 2009. The key contribution of this report is in giving a quantitative estimate of the impact of the recession on the Indian software industry in 2009. Overall, the respondents expect a 19% YoY drop in revenues in FY2009 with the first quarter being the worst. 1Q2009 is expected to show a whopping 35% drop and the situation will gradually improve each quarter with 4Q2009 actually ending on a positive note with an expected growth of 2% compared to the same period in FY2008. As can be seen from Figure 2.2, the expected revenue drop ranges from 8% in the case of Delhi/NCR and 9% for Bangalore, all the way up to 42% for Hyderabad, which is clearly the worst affected. 15 other cities, not shown in the graph, all are reporting declines in the same range. Surprisingly, Pune and Chennai are expecting a growth in their topline revenues inspite of the recession – with Pune clocking in at a huge 17% YoY growth. An extended abstract of the report can be downloaded from here, and the full report, which also contains sector-wise breakups and other details, is only available as a paid download for Rs. 7500 (or USD 300 for purchases outside India). Of course, the big news, as far as PuneTech is concerned is that Pune is far outperforming all its peers in handling the recession. Unfortunately, it is unclear what the reasons for this are, because we could not download the full (paid) report. However, that has not stopped a certain TV channel (that will remain unnamed) from jumping to conclusions and blowing the news out of proportion. Here’s a relevant clip from their news report. (For the record, my comments have been taken completely out of context, and I wasn’t even being serious when I said all those things, and I most definitely do NOT think that punetech.com is the reason why Pune is doing better than Bangalore.) In any case, the clip has some interesting reactions of the average techie (fast-forward to the 2:40 mark), and I’m sure managers are going to have a tough time in meetings tomorrow. In any case, the full video is here. Anyway, what do you think are the reasons for this positive impact of the recession? Please let us know in the comments section below. You are now a TV celebrity! 🙂 I think he really meant it that PuneTech was responsible for keeping the recession out of Pune. Btw, why are Pune developers more Productive again? @Santosh, From 12:49am to 9:25am did you actually believe the news?! PuneTech Rocks !!! You guys are doing some real great work!!! Keep it up! The link to INHR Associates site seems to be broken. @Vipsy, I checked the URL and it is correct, but the site appears to be down. Hopefully it should be back later in the day. ROTFL! Good one. Must’ve taken a long time to do the video… but very realistic! and inhumanresources… awesome! You should book it and start something there! The news is really good but this is so hilarious!! Please accept that this is a April fool prank. I cant believe this that these guys could turn it into an sensational news byte. @anon, yes, we accept that it was a prank. The news video was also fake. And as for how to measure the effect of pub culture on programmer productivity, I am willing to participate in a study – especially if one of the focus areas is the study of the effects of vodka. Hillarious it is, but the bursting student power and bright minds in Pune really are doing a good job. Keep it up PuneTech. Even if it may be a prank (which I seriously doubt! ), the news channels in India are so news hungry, that they may actually call up PuneTech and ask to feature this “news” as real news. BTW the field news reporter in this video has done a great job. She has future in real news reporting. @Old Hand, it was a prank. Since you admit it was a prank, I think it was in bad taste. Perhaps because I am one of those hit by the recession? Be that as it may, why does the whole thing reek of a publicity stunt? @Rosemary, I’m sorry that the recession hit you. Even I have friends who were fired due to the recession, friends/family whose jobs have become hell because of the recession, friends whose company is in really bad shape because of the recession. Even my own income has gone down significantly because of the recession. The recession is real, it is severe, and it is here to stay for a couple of years. Be that as it may, we can’t stop making jokes about issue X because somebody negatively affected by X will find it in bad taste. For every joke, there is someone somewhere in the world who finds it in bad taste. We’ll be left with no jokes at all. As for publicity stunt, you got us there! Yes, we admit it was a publicity stunt. If anybody here was under the impression that this April Fools prank had some nobler, higher purpose, please be advised that it did not. Hats off to all the pranksters. Majja aali! I must say.. good attempt :).. Just an Idea, how about launching a PuneTech News channel on Youtube.. may be covering interesting event’s in Pune’s Technology world..
Rosemary, not just you, even I was hit by recession. I had a major wound near my knee and broke a rib. I am in the doctor’s clinic right now. Ye recession jo hein naa, sub ko hit kiye chale ja raha hein – kya kaare? COME ON! It was a April Fool prank. You don’t have to take it so seriously.